Kali has the potential of becoming a rage with the viewers, feels Paresh C Palicha. 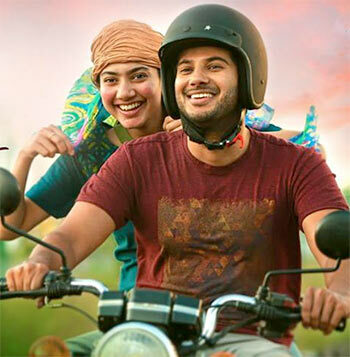 Dulquer Salmaan's character Siddharth in Kali is perpetually irritated. There is nothing wrong with the world around him, it's just that his brain is wired in a peculiar way. He dislikes noise, even a casual chat beyond a point makes him uneasy. The only person who can keep a check on his mood swings is his wife Anjali (Sai Pallavi). They were lovers from their college days and have married against the wishes of their parents, so they lead a lonely and mundane life. We anticipate the worse to befall on them any moment because of Siddharth’s volatile nature. This is the basic premise of Sameer Thahir's Kali. The first half of the filmis spent in establishing the characters and the plot. The writing, by newcomer Rajesh Gopinadhan, adds layers to the characters, giving more substance to the subject as we move forward. For instance, Siddharth works in a bank where he has to be in direct contact with the customers, and his grumpy nature puts his career in jeopardy. There are many such instances where exclamation marks are given to bring a point home. Like there are loud drumbeats when Siddharth’s temper is boiling followed by a deafening silence when he gets it under control and we know that a crisis situation has been temporarily averted. So, in the first half, we see a man with a quirky personality trying to fit in society by being ‘normal’ and by behaving in a socially acceptable way. In the second half, the narrative changes gear to be in a thriller mode and becomes a road movie. This transformation is smooth as we see the characters we care for getting embroiled in undesirable situations. Even here, the teamwork between the writer and the director is highlighted, as they take time to build the scenarios before making their characters jump into them. As for the characters, they do have their own shortcomings and they are aware of that. Siddharth understands that something is wrong with him and tries to improve his behavior. He does not boast of his righteousness or justify himself. Dulquer Salmaan is near perfect in portraying the character. Sai Pallavi brings a magic potion with her as Anjali that would make any man change himself for her if she tells him to. Chemban Vinod Jose does gives us goosebumps with his villainous act in the second half. Kali has the potential of becoming a rage with the viewers.